Profile is a blend of our best lots of Cabernet Sauvignon, Merlot and Cabernet Franc, chosen for their concentration, depth of flavor and fine tannin structure. This wine was aged in new French oak chateau barrels and bottled unfiltered. It is very dark and opulently structured — characteristic of this very ripe vintage. In its youth the wine is loaded with flavors reminiscent of dark berries, plums and black cherries, with fragrant notes of vanilla and spice. The wine’s mouthfeel is rich, round and seamless. “… perhaps best exemplified by the flagship Cabernet-blend Profile, really hit its stride with the ‘97 vintage. Profile ( 72 percent Cabernet Sauvignon, 26 percent Merlot, 2 percent Cabernet Franc) sets a new standard for Merryvale, more commonly seen in the Top 100 for its white wines. Winemaker Stephen Test joined the winery in 1998. 5200 cases made. 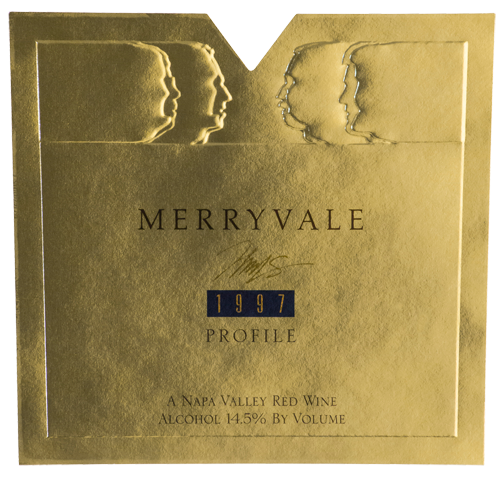 “… the equal of Screaming Eagle at a fraction of the price…Merryvale 1997 Profile, is an appealing wine with massive fruit and splendid texture. It has the exceptional concentration of fruit that is typical of the vintage in the Napa Valley.